Math Magic Tricks Are Lots Of Fun And Can Help Teach Kids Math Skills. Not only are math magic tricks a fun way to amaze friends, they can also help kids build some math skills along the way! In this math trick, the math magician performs an instant calculation by quickly giving the sum of any four numbers a volunteer covers up! Ok, you printed the magic square, right. Good! The first thing you need to know before I show you the trick is the square that you see on this page is special. It’s actually called a magic square. No kidding......Do you know why it’s called a magic square? Notice what happens if you add up all the numbers in the top row. Now take a look at the second row. Can you guess what the numbers in the third row add up to? If you guessed 65, you’re right. But there’s more……. The numbers in the first column add up to 65 also. And the other two columns also add up to 65. And the two diagonals also add up to 65. So that’s why it’s called a magic square. 65 is the magic number. Now back to our math magic trick. First you need to know what the magic number is for the square you are using. 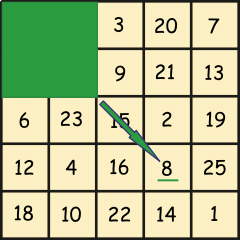 For the square shown on this page, I already explained to you that the magic number is 65. Next, you figure out what number to subtract from 65 after the volunteer covers up any four numbers. I'll show you how to find the number to subtract from 65 with a few examples. Look at the first example below. Here you can see someone covered up four numbers at random with the green square. As soon as they cover up four numbers with a square, in your mind you will extend a diagonal line, two numbers past the outside corner of the covered square. In order to go over two numbers past the outside corner of the covered square, you can only go in one direction. If you try to go diagonally in any other direction, you will not be able to go two numbers over. Take a look at the picture below. Notice that you can only extend the line two numbers in one direction. The number you arrive at is 8. This is the number that you subtract from 65. So the numbers that are covered add up to 57. Look back at the top picture and check for yourself to see that the numbers that are covered up, when added together are 24 +11 + 5 + 17 = 57! 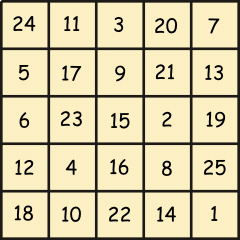 By the way, I am going to add more magic squares on this page so you can use different ones. So check back in a day or two. 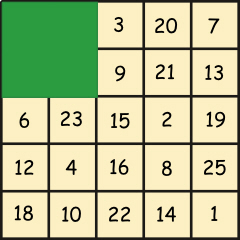 You can also find out more about magic square puzzles here. For more math magic tricks go to the math tricks page by clicking the link below.